Pfeiffer Big Sur State Park and Fernwood Resort share a border and you can easily hike into the state park from our campground. Buzzards Roost trail is the most easily accessible hiking trail from the Fernwood Resort. Buzzard's Roost Trail: 4.8 miles rountrip loop, moderate. Along shady redwoods to a switchback trail through tan oaks and bay trees, peaking at Pfeiffer Ridge with beautiful coastal views. Pfeiffer Falls Trail: 1.4 miles roundtrip from trailhead. Easy hike. 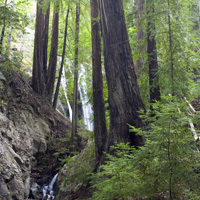 A scenic hike along Pfeiffer Big Sur Creek through one of the park's finest redwood groves ends at a 60-foot high waterfall. Valley View Trail: 2 miles roundtrip from trailhead or 1/2 mile from Pfeiffer Falls; easy. To beautiful views of Point Sur and the Big Sur Valley. Oak Grove Trail: 3 miles roundtrip from the entrance to Pfeiffer Big Sur State Park, easy to moderate hike. This trail intersects with the Pfeiffer Falls trail. There is a variety of ecosystems beginning with redwood groves, open oak woodlands, and dry chaparral. Mount Manuel Trail: Beginning at the Oak Grove Trail, 8 miles roundtrip, strenuous. A steep, beautiful climb to the top of 3,379 foot Manuel Peak. Gorge Trail: 1 mile into a steep narrow gorge with huge granite rocks and swimming holes. Andrew Molera State Park is located a few miles north of Fernwood and has some fantastic hiking and beachcombing. A short drive or a bicycle ride through the Big Sur Valley would be appropriate. Creamery Meadow to Molera Beach: 2 miles roundtrip, easy. 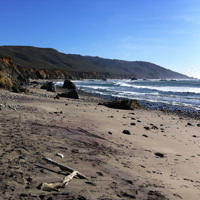 A stroll through Creamery Meadow to a driftwood covered Andrew Molera beach. Molera 8-mile loop: 8 miles roundtrip, moderate to strenuous. A combination of the Ridge Trail, the Panorama Trail and the Bluffs Trail with great coastal views and beach access. East Molera Trail: 3.2 mile round trip. The trailhead begins about one-third of a mile south of the park entrance on the east side of Highway 1. Sweeping views of the Big Sur valley. Hike through coastal oak forest. River Loop Trail: 4 mile loop. This trail offers the opportunity to take a dip in the Big Sur river. Some of the trails at Andrew Molera have mountain bike access. Directly across Highway 1 from Andrew Molera is the entrance to the Old Coast Road, which is also good for mountain bike riding. Ventana Wildlife Society has their California condor field office and Big Sur Discovery Center in Andrew Molera State Park. They often offer guided birding adventures so check the local bulletin board for their schedule. Birder's checklist of all the birds known to exist in Big Sur. Julia Pfeiffer Burns State Park is a few miles south of Fernwood but worth the drive to see the beautiful McWay Waterfall and to enjoy the Ewoldsen trail. 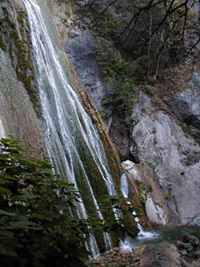 McWay Waterfall Trail: .64 mile roundtrip, easy. A quick walk to an overlook facing McWay Falls, an incredible 80-foot waterfall that drops directly onto the sandy beach. Partington Cove Trail: 3/4 mile - easy. About a quarter mile down from Highway 1 to Partington Cove tunnel which takes you to Partington Landing. Built in the late 1800's to ship redwood and oak lumber to San Francisco. Later used for boot legging, I'm told. Partington Cove trail map and more information. Partington Cove offers a hike to the beach and is also access to Tan Bark and Tin House trail. Pick up a digital brochure PDF. California State Parks is proud to present Ranger guided whale watching and California condor spotting. Come celebrate with us the migration of the California Gray Whales off the Big Sur Coast and keep an eye on the sky for soaring condors. 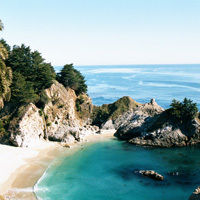 Meet at the McWay Falls overlook trail at Julia Pfeiffer Burns State Park. Walk out to the point. Drop in. Rangers will be available with binoculars. Weather permitting. From the redwoods to the sea describes the unique topography of Limekiln State Park. 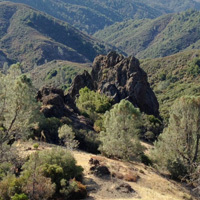 This gem of a park, 52 miles south of Carmel, adjoins the Ventana Wilderness area of the Los Padres National Forest. On the the legendary Big Sur coastline where the Santa Lucia Mountains meet the Pacific, the park's more than 700 acres offer peaceful solitude, a breathtaking waterfall, and seascapes of the Monterey Bay National Marine Sanctuary. Watch wildlife from the beach or along fern-lined trails, and picnic among the redwoods. Deep within their forest sanctuary, along the west fork of the Limekiln Creek, tower the four enormous kilns from which the creek takes its name. 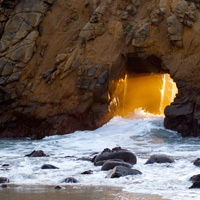 Pfeiffer Beach offers great sunset views and short hikes along the beach. Directions: Travel 1.5 miles south on Highway 1, take 2nd right after the Ranger Station at single lane road. Two miles down a single lane road to the beach. Dogs are allowed on Pfeiffer beach. Los Padres National Forest offers millions of acres of hiking and is mostly accessed by 'backpackers' but there are many trails available to you from roadside turnouts adjacent to Highway 1; Salmon Creek,	Soda Springs Trail, Mill	Creek, Pacific Valley Bluff Trail, Sand Dollar Beach, Jade Cove, to name a few. There are many resources and books available to help you if you are interested in backpacking. Sand Dollar Beach & Jade Cove: Sand Dollar Day Use area is located on Highway 1 34 miles south of Fernwood at Mile Marker 13.8. Beautiful place for beachcombing and hunting for Big Sur Jade stones. Rugged cliffs overlooking the ocean. Visit Ventana Wilderness Alliance website for backcountry trail information. Garrapata State Park is located between 7 miles south of Carmel and about 20 miles north of Fernwood between Mile Markers 63.0 - 67.2. Garrapata State Park is 2,879 acres between Andrew Molera State Park to the south and Point LobosState Reserve to the north. 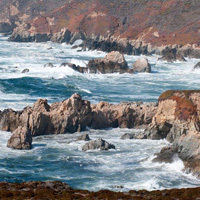 Beautiful, rugged coastal bluff hiking, beach hiking and hiking on the Rocky Ridge Trail and Soberanes Canyon Trail. Rocky Ridge Trail: 6 miles out and back or a 4.6 mile loop. Sobranes Canyon Trail: 2.2 mile out and back or a 4.6 mile loop. Garrapata State Park brochure with hiking trails (PDF). Point Sur State Historic Park and Point Sur Lightstation is located about 7 miles north of Fernwood at Mile Marker 54.1. You can't miss it! It's a big rock on the point with a lighthouse and structures on top. Point Sur Lightstation is visible from Andrew Molera State Park. Although they do offer tours, you cannot be unescorted in Point Sur State Historic Park. 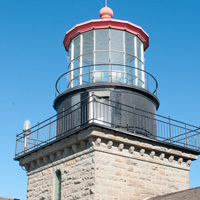 Point Sur Lightstation offers tours year round. 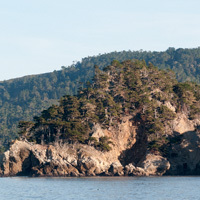 Point Lobos State Natural Reserve is located just south of Carmel and about 25 miles north of Fernwood. Offers some of the most spectacular coves and meadows available in Big Sur. Day Use only. Cypress Grove Trail: .75 to 3 miles or more round trip. Plenty of offshoots and coves to explore.